Spot the odd one out. Artist, Collector, Gardener, Digital Media Buyer. Did you get it? Yes, unbelievably, the Cub Scouts don’t yet offer any recognition for digital media prowess. Fortunately, the major digital media owners do, with Google in particular being very keen on badges and certifications. In fact, they offer about enough to cover both sleeves of your average Cub jumper. With these certifications and badges being of great importance to agencies like ours, we thought it best to cut through the jargon and have a look at what the badges mean, how to get them, and which truly matter. Google Ads Certifications recognise an individual’s proficiency and professionalism in online advertising. Individuals earn certifications by passing online assessments set by Google. In order to become certified in any specialism, an individual must pass the assessment relevant to that specialism, as well as the Google Ads Fundamentals exam. Assessments for specialisms need to be retaken each year, alongside the Fundamentals exam, in order to count towards certification. The barriers to entry here are really very low, allowing anybody who has managed a couple of small accounts for a few months at a time to claim Google Partner status. This isn’t to say that a Google Partner doesn’t know what they’re doing in PPC, but it’s not a marker of significant experience or ability to scale activity. 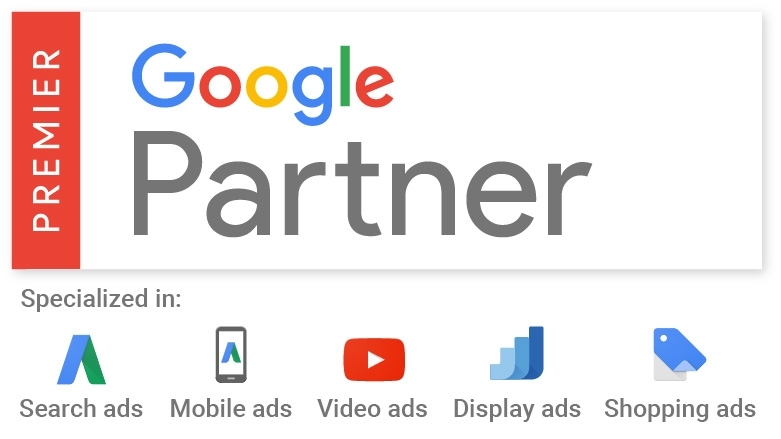 Premier Partner status is an extension of the Google Partner programme, and is designed to recognise agencies who have surpassed the basic levels of qualification. Premier Partners must have at least two Certified Individuals associated with their Google Ads manager account, and meet a higher (though not clearly specified) spend threshold. In order to maintain Premier Partner status, agencies also need to meet certain performance criteria to show that the accounts they manage are run according to Google best practices and are healthy and growing. Premier Partners can also gain specialisms in Search, Mobile, Video, Display and Shopping by having at least two certified individuals in each specialism and a spend of greater than US$10,000 in the relevant area over a 90-day period. SearchStar have been Google Premier Partners since the programme’s inception and hold specialisms in all five disciplines. With over 30 certified individuals, highly-rated performance record, and a 90-day account spend of many millions of pounds, we’d like to think our status in this regard is pretty secure. The Google Marketing Platform encompasses a range of Google products, including Analytics, Data Studio, Optimize, Surveys, Tag Manager, Display & Video 360 and Search Ads 360. Partners are those agencies that have been vetted by Google and been able to demonstrate market-leading capabilities in these products. The certification requirements are markedly more stringent than for the Google Partners programme. Partners need to show that their company understands the Google Marketing Platform and they have a track record of delighting clients by using it. Google requires that Partners have at least five full-time experts working on the Platform and that they are certified in the relevant areas. Furthermore, Partners are subject to a comprehensive review of how they plan, manage and deliver work through the platform, alongside two in-depth case studies that demonstrate advanced work and thinking. It’s an arduous and testing process, as certification is not something that Google awards readily. Google do not invite agencies to “Become a Partner”. Rather, agencies are asked to “Join the Waiting List”. Getting to the front of the queue is no easy task and really highlights the genuine value of this level of certification. Google opened-up its Shopping Ads platform to other Comparison Shopping Services (CSS) following an EU ruling in 2017, effectively allowing other comparison shopping websites to run ads “directly” in the Google Shopping Ads unit at a discounted rate. Merchants are able to use a CSS to access the benefits of this discount, without having to build a comparison website of their own. The CSS Partners Program is Google’s way of ensuring CSSs meet standards with regards the quality and functionality of their comparison website, their understanding of Shopping Ads, and ability to help merchants with Shopping Ads. Comparison Shopping Partners must have an eligible CSS website, be registered as a Google Partner, and have at least one employee who is Google Ads Fundamentals certified and Shopping certified. They also need to work with at least 20 individual merchants to prove their ability to scale operations. By using a Google Comparison Shopping Partner, merchants are not only able to take advantage of the discounted rate for buying Shopping Ads, they are also then eligible for significant SpendMatch incentives from Google. These incentives continue to change but, at the time of writing, amount to around 5% of Google Shopping Ad spend. Unless you’re working with a CSS Partner, you won’t be eligible for this rebate.